Discussion in 'Announcements' started by Birdseed, Oct 18, 2008. I just wanted to tell you that the full version of Somersault is now available for download. Until now you were only able to play the online demo but the released full version has more free playable levels. Tried to play online Unity version. After 3 attempts that creature is still not inside the basketball basket. Something is totally wrong with the control scheme in that online version - clicks are constantly ignored. I played standalone version. Fun mechanics and full 3d! The main problem is that I had an impression that rest of the game will be always about avoiding collisions with stuff. To little variety for my taste. I played to the end, though. The game itself had a certain charm and I liked the premise of it. Sadly, I struggled slightly as I was using a trackpad on a laptop, and it does cause some difficulty issues (that obviously is out of your control - so no negative comments regarding that directed to the game). Good music, and some nice particle effects - nice work. Thanks for your positiv feedback. Does that problem still exist when you play the downloaded version? As the online version runs fine in my browser. There will be more variety in the full version. But because the controls are very new we had to show the core game mechanics in the first levels to make everyone understand the controls. I think the game offers more gameplay than the average casual game. Our game programmer coded the game on a Macbook where he only had a trackpad to and guess what. He is a better player with his trackpad than many others with a mouse. The best strategy is to play the game very calm. Do not make to hectic moves with the paddle. Keep an eye on the rainbow to aim where you want to jump to. Ok, much better than the web version. Indeed, half of the clicks in web version were ignored on my computer (XP/Opera 9.6). - Main character inside the game looks like a ball of garbage, not that cute creature I see on the picture. - Falling in water equals "drowning+game over" instead of bouncing out of water with just lost heart/energy. - Same applies to falling in level 3 (inside the tree) - shouldn't be instant game over. - No loading indicator between levels - the game just feels locked up. - Tutorial should be interactive, e.g. using "in-game REPLAY" technology, not just showing pictures of what to do as it's not self-explaining with such controls and gameplay mechanics. Other than that, I've enjoyed 3 levels, though the graphics look like a mix of Sega Saturn's Pandemonium and Nights into Dreams on Dreamcast - good style/palette, far too low polycount - it's 2008, not 97/99! 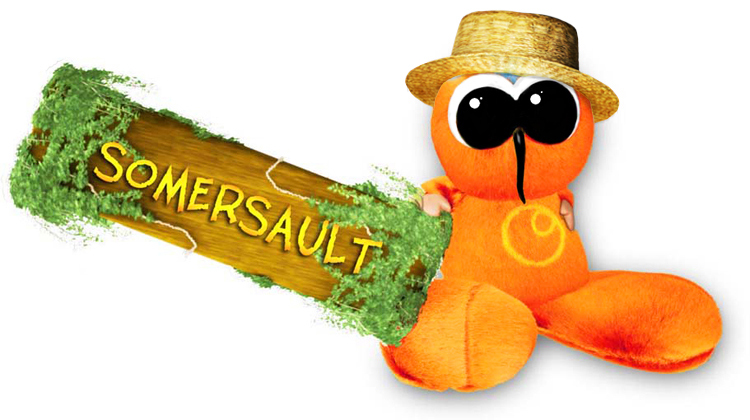 Somersault is nominated for the European Innovative Games Awards. Concerning the instantkill objects in the game we decided to include that because the player can start every unlocked level as often as he/she likes and the whole game felt just way to easy without these. How long does one level load on your pc? We included a loadingscreen in earlier builds but the loadingtime was so short that you rarely had the chance to see the screen. Yes the polycount is low. It is our first game and we didn't had an idea what was a good polycount for low end computers. So we decided to make the graphics better functional then too highpoly. When I look back now it was probably not the right choice but it is way to complex to change that at the moment. Now it makes a lot of sense when you say it's nominated for innovation award by this list of respectable people who play games for a living! The funny part that I can't find a mention of that nomination on their site as well as credits for your game. As I suppose my taxes are going into that award, I feel like stepping in here! On the performance part - I've got a quad core 2.4GHz and it takes 5-10 seconds between levels. I was playing in 1920x1200 though. I've got a quad core 2.4GHz and it takes 5-10 seconds between levels. I was playing in 1920x1200 though. 5-10 seconds are way to long under normal circumstances it should no longer load than 2 seconds.How much does it decrease if you set the resolution to 1680x1050? I didn't want to appear arrogant to you by writing 'innovative' or mentioning the nomination. I do not know any of these judges. But only because they have respectable jobs (also inside the video game industry) I would not say that they have no idea of videogames. And yes it is very sad that they haven't released the list of nominees because it would have helped us to popularize Somersault. As this is an european award you indirectly payed for it just like about half a billion other european citizens. You are also paying for a lot of awards which you probably never heard of.